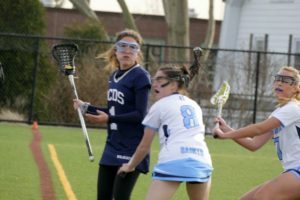 Three days after returning from spring break, the Wildcats’ Girls’ Lacrosse team opened their season at home against Canterbury. In a competitive battle with lots of ups and downs, the Wildcats lost 13-10, but learned a lot, while learning a few lessons. From the start, the Saints stormed the field, winning the first three draws and jumping out to a 3-0 lead. 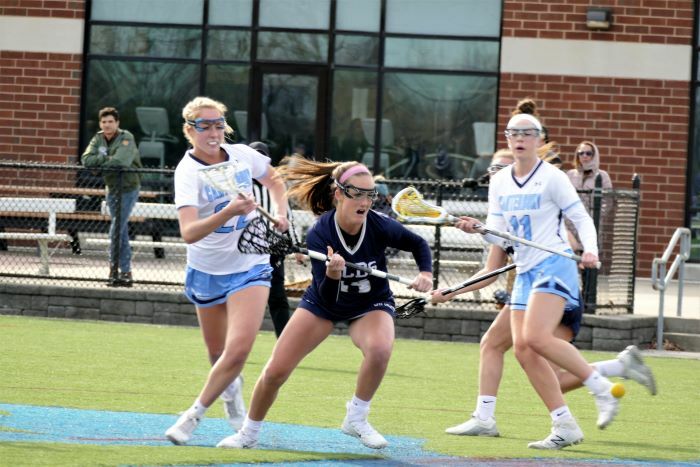 On the next series, Canterbury threatened to score their fourth consecutive goal, but Wildcat goalie Kat Brydson made a great save, allowing the Wildcats to gain enough confidence to flip the direction of the game. They transitioned the ball via deft passes, and Laura Baine scored the first goal off a long drive. Rye Country Day won the next two draws, and Charlotte Price scored off a quick cut. Baine knotted the game at three on an assist by Alik Shehadeh. Natalie Sanchez looking for an open player. Canterbury answered with two quick goals. The Wildcats clawed their way back, making two eight-meter shots and were down 7-6 at halftime. Rye Country Day tied the game at 7 on the first play in the second half, but then had difficulty adjusting after Canterbury changed their draw formation. Coach Georgette Summers called a timeout, but after that the defense had trouble connecting and became unnerved, which resulted in multiple turnovers. During this time, the Saints scored five in a row. The Wildcats staunched the bleeding, coming back to within two for a final score of 13-10. Price had four goals and Baine three. The team had 21 shots over all and went 50/50 on draw control. Brydson made ten saves.